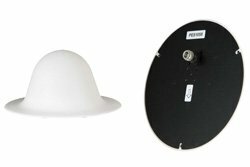 Dome antenna PE51058 from Pasternack is featured in our extensive in-stock radio frequency directional antenna selection. This low pim multi band ceiling dome antenna uses has a frequency range of and a 6 nominal dBi gain. Our ceiling mount dome antenna uses N female connector and is rated for 100 Watts input. Our radio frequency dome ceiling antenna. PE51058 is part of over 40,000 RF, microwave and millimeter wave components available from Pasternack. This dome RF antenna can ship worldwide the same day of the purchase as with our other available RF parts.